We had our first float in Albany's Heritage Day parade this year! The other Last week at Albany Family Dentistry, we celebrated the addition of Dr. Megan Raiber to our team! We are excited to add Dr. Megan Raiber to the Albany Family Dentistry team this June! Did you know Albany Family Dentistry will soon be one of the only dentists in Minnesota to use solar energy? Starting this fall, we'll be solar powered! Our Green Transformation Has Begun! Construction has begun! Looking forward to sunny days. Our office will be solar powered. We are very excited to be one of the only dentists in Minnesota using solar energy. We have an exciting new change happening at our office. Albany Family Dentist is going to be the first dentist in MN to use solar energy to power our clinic! Leah Hoffarth was this months winner. The basket included Easter chocolates, sidewalk chalk, egg dye, everything to make Easter cut out cookies, Easter platter, and Spring napkins. June Scherping is this month's basket winner! Annella Blonigen is our lucky winner for the November drawing! Nancy Beutz is September's basket giveaway winner. Cory Klemmer won this month's basket giveaway! He's all set for the 4th of July. Congratulations to this month’s winner, Sally Bueckers! 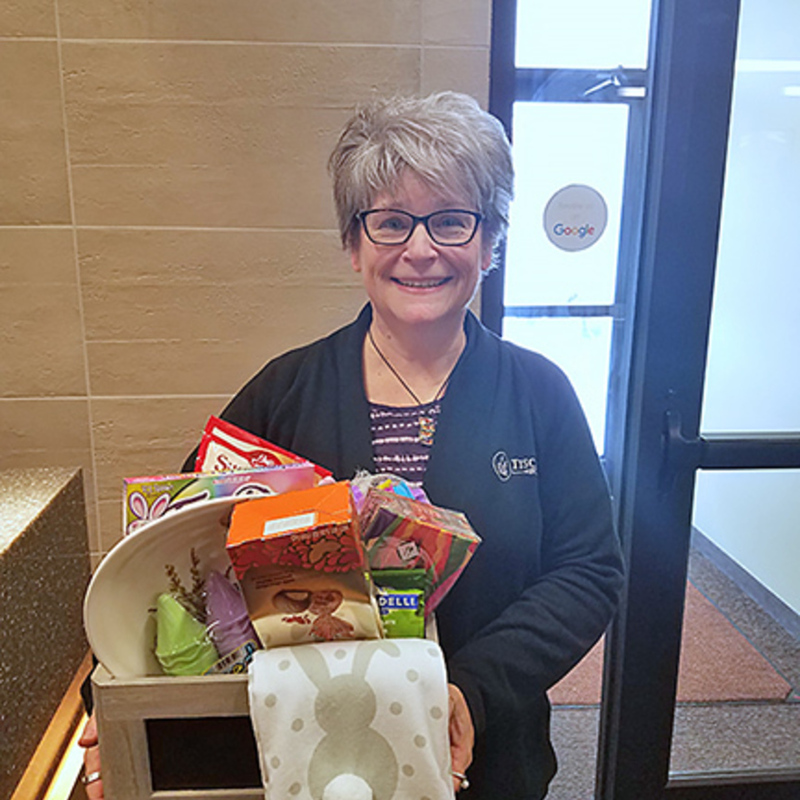 Al is April's monthly basket winner! He went home with four Rox game tickets, four baseball hats, snacks, and a gift card for concessions and apparel. Congratulations to our March monthly drawing winner, Ann Kuklok! She received a pot of gold candy and $50.00 of gold coins. Congratulations to our November monthly drawing winners, Karl and Amanda Radamacher! They won some great items for their Thanksgiving dinner. 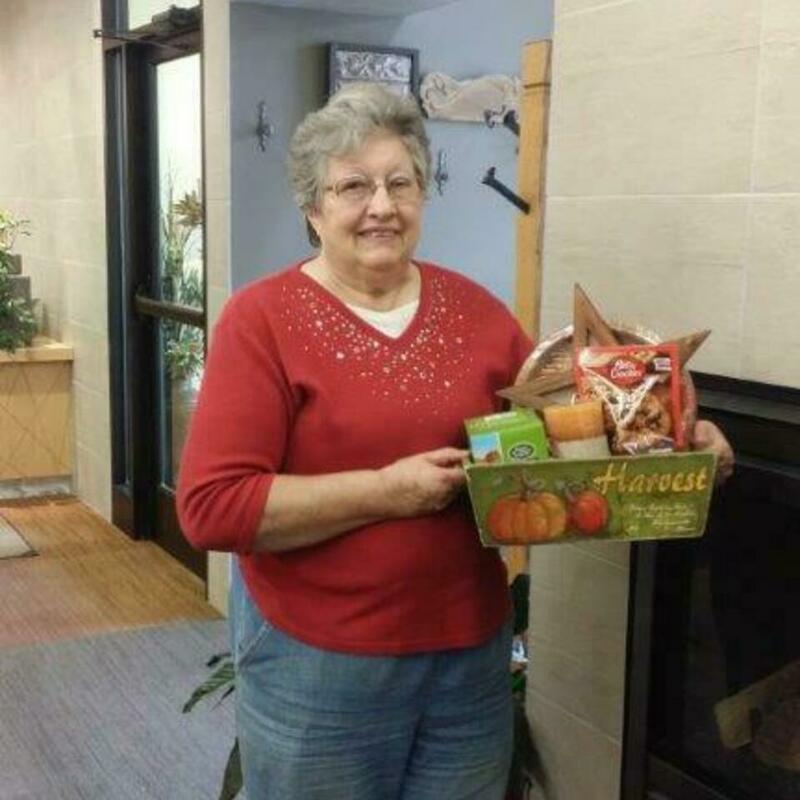 Here is our October basket winner, Judy. The basket was everything Halloween; décor, kids creepy sticky insects, and a tub to put Halloween treats in. Juel Meyer is the winner of our September basket. This basket was an autumn apple theme. It included some fun fall items. Here is our August winner, Bobby Solarz. He won a picnic basket with everything you need for a picnic and a $25.00 gift card for Teals Grocery. Here is our July basket winner, Missy Rieland. She received a summer fun basket consisting of beach towels, flip flops, squirt guns, water noodle, sun screen, and treats. Congratulations to our No Cavity Club winner, Ramona! We choose 2 winners who didn't have cavities at their check-up every quarter. Ramona won a board game! This is our monthly basket winner, George (and Rose) Eiden. They won a basket with spring bulbs, a watering can, gardening gloves, sprinkling wand, and a garden wind chime. This is our April basket winner, Delrose. She was happy to get this Italian night basket. It included pasta, sauce, olive oil, dessert sticks, pasta bowl and pasta spoon. Congratulations to our February basket winner! He won a wine and hors d'oeuvre basket. It had wine glasses, a wine bottle stopper, various appetizers, and dinnerware. He won a large and a small Crockpot, with soup mixes, dip mixes, and soup bowls. Congratulations to our November basket winner, Lisa. She won a Thanksgiving dinner receiving gift certificates from Teal’s Grocery, Albany Bakery and Simply Flowers. Congratulations to our October basket winner, Emily. Her basket contained a corrugated metal pumpkin with flickering lights and a pumpkin scented sachet and Halloween sign. Congratulations to our September basket winners, Holly and Corey Borgerding. Their basket contained items like mugs, caramels, chocolates, apples, hot chocolate, and a blanket. 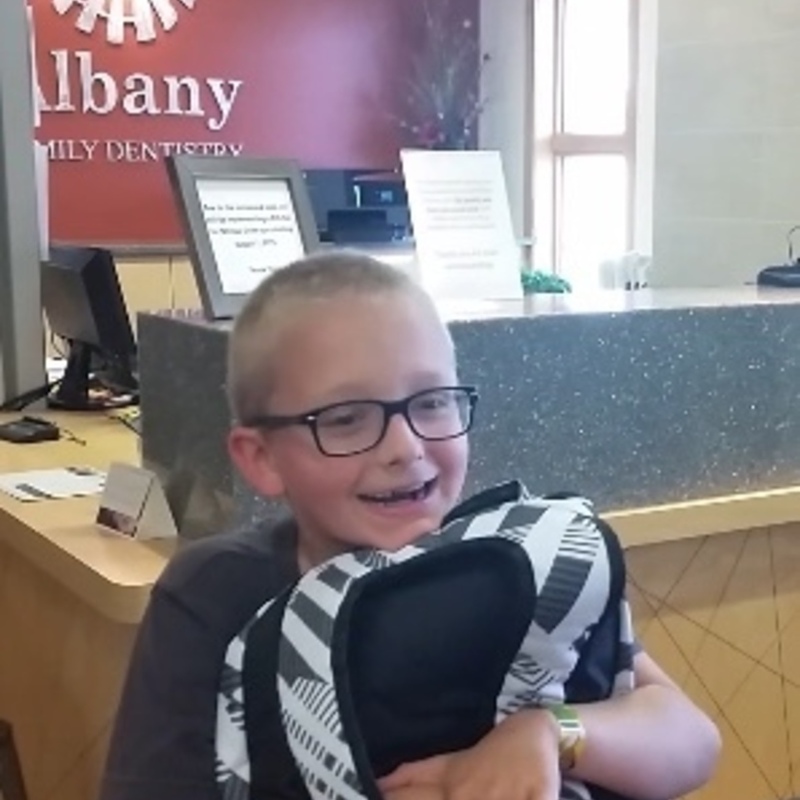 Congratulations to our August basket winner who won a backpack full of school supplies!! Congratulations to our July basket winner, Roger! He won a BBQ party grilling kit, including grilling utensils, meat seasonings, grilling pan, grilling mitt, grill cleaning brush, and meat thermometer. Sign up for our monthly drawings at your next visit! Congratulations to our May basket winner, Delrose! She won some great items for summer. Sign up for our monthly drawings at your next visit! This is the winner of our April basket giveaway! Congratulations, Bobbie! She won a Thompson’s gift card with a succulent garden planter. This is the winner of our September basket giveaway! Congratulations, MaryJane!